The market for cryptocurrencies has exploded, and despite the bearish streak, their use and volume has grown more than practically any other asset ( either digital or physical) in the same period of time. Bitcoin (BTC) is the cryptocurrency of reference, not only because it is the first token ever created but also because it has the largest marketcap and the most significant community of users and developers in the entire ecosystem. A recently published study by DataLight concluded that during the bearish streak of 2018, where several cryptocurrencies lost more than 90% of their capitalization, the number of transactions increased considerably, revealing that there is not necessarily a correlation between the price of BTC and its acceptance or popularity among traders and users. First, from a positive point of view, the team noted that Bitcoin outperforms PayPal in transaction volume. However, it still lags behind Visa and Mastercard. It is very possible that in the near future, BTC and Master will change positions. However, they emphasized that according to their research, Bitcoin is a better option for sending large amounts of money, beating Visa not only in processing time but in the lower cost associated with such transactions. They also point out that Bitcoin has a long way to go before we can talk about mass adoption. 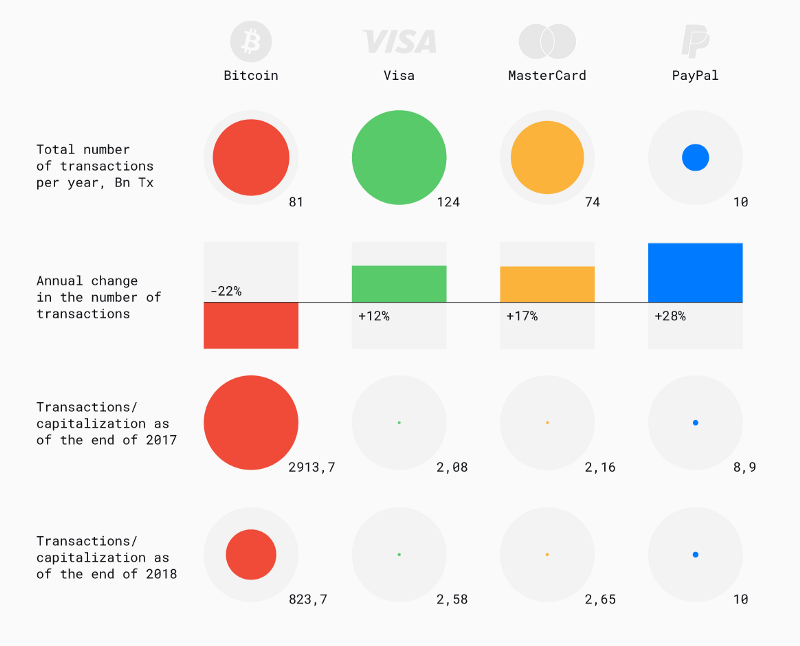 Its 25 million accounts in 2018 are minimal compared to the more than 5 billion Visa and Mastercard cards available in the world.